Now THAT was a damn good speech! How to captivate your audience, Obama style. Today was President Barack Obama’s second inauguration…and WOW. I have to say, not only was I hanging on his words, but I was completely captivated by him. Everything about him commanded attention and respect. Obama is a power-brand…and a big part of that brand is his gift of public speaking. Needless to say, I’m sure Obama has a pretty fantastic speechwriter and speaking coach. But it’s more than that. His mannerisms, gestures, voice and presence, matched with his passion, confidence and charisma, blend together beautifully. He recites his material seamlessly, without staring at notes or a teleprompter (gasp!!). This started me thinking about public speaking, and what our speeches (and their delivery!) say about us. After all, pretty much everyone has to give a speech at some point, and I think most would agree that it can be a nerve-wracking experience. So what are some keys to confidently delivering “a damn good speech”? Of course, there’s preparing and writing your speech, the delivery, the body language, the eye contact… but what can we learn from Obama, who clearly has such a powerful effect over his audience? “President Barack Obama uses three public-speaking techniques to captivate his audiences. Like all of us, sometimes he has an off night. When he’s at his best, though, Obama is a gifted speaker who has something to teach all leaders in business and politics, regardless of their political opinions. Here are three of the techniques that make his speeches memorable. 1. Transcendence. By using concrete and tangible language, Barack Obama can transport us to another place and actually paint a portrait that we can see in our minds’ eye. There’s a reason why audiences are fed up by the same empty, meaningless jargon so prevalent today in business language. It’s not specific enough. Nobody cares that you offer “A best-of-breed solution for a cloud based ecosystem.” Your audience demands specificity. Use concrete examples and always answer the question, “Why should I care? 2. Repetition. Speechwriters call this technique “anaphora:” repeating a word or phrase at the beginning of successive sentences. I simply call it, repetition. Repetition used artfully helps to clearly emphasize one idea and make it memorable. 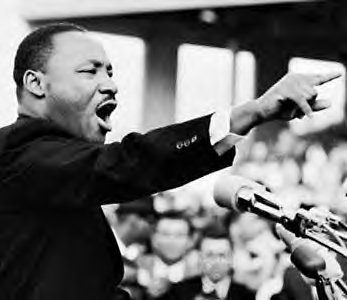 One of the best examples of repetition can be found in the famous speech by Martin Luther King Jr. The previous examples also demonstrate that Obama likes to group ideas into sets of three. If you’ve read my columns or watched my videos, you know I’m a big believer in the “Rule of 3.” If you’re going to list ideas or benefits, don’t offer up too many things to remember: give me three instead. Three is a much more powerful number and easier to remember. 3. Gestures and voice. Many years ago I had a conversation with a professor at the University of Michigan who studied hand gestures. Dr. David McNeill found that rigorous, disciplined, and confident speakers use hand gestures more than average. The gestures reflect the clarity of their thinking and actually give us—the audience—confidence in their leadership. 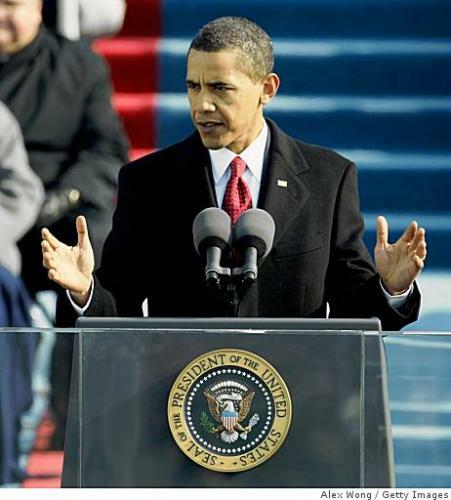 President Obama, like many effective speakers, uses gestures to punctuate nearly every sentence. Obama also uses his voice effectively. He slows it down, lowers his volume, and pauses for impact. At other times he speeds up his pace and raises the volume of his voice to underscore a key sentence. So his secrets are revealed, and it’s just a matter of making them your own (and of course practice, practice, practice!). Now go out there and Barack ‘em dead!